Nonverbal communication - conveying a message to another person through a body movement or gesture - is one of the most powerful and widely used forms of communication among humans. Types of nonverbal communication include hand gestures, facial expressions, and posture. Touching another person is a form of nonverbal communication. Even the way you dress communicates messages nonverbally. According to Help Guide, understanding nonverbal communication and learning to use it effectively will help you navigate many of life's challenges. Proper nonverbal communication can be as effective as giving all the right verbal answers in a job interview. However, poor nonverbal communication can hinder an interviewee's success in a job interview. Reference for Business lists an interviewee's arrival time to an interview as a form of nonverbal communication to an interviewer. If you arrive to an interview late, you are nonverbally telling the hirer that you are irresponsible, disorganized or not interested in the position. If you arrive on time or a few minutes early, you send a positive message. Another nonverbal form of communication at the start of a job interview is the handshake. 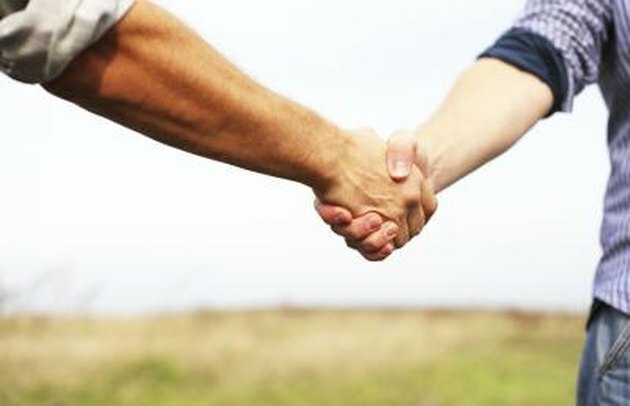 Psychology Today claims the best way to make a good first impression is through your handshake. It should be strong and last between three and four seconds. You should make eye contact with your interviewer and shake her hand with a complete grip. A strong command of nonverbal communication helps a relationship flourish and thrive. Nonverbal cues can help you communicate interest and trust to your long term mate or to a new date. When your partner talks, an effective nonverbal gesture is to lean toward him to show that you care about what he is saying. Holding a date's hand is a nonverbal gesture of interest and attraction. Holding a partner's hand shows her that you are together in a problem or crisis, according to Dr. Sheri Meyers Gantman, on the website Straight from the Heart. Dressing nicely is another nonverbal gesture that you want to please your partner. You may not be aware of the messages you send to your children without even using words. Improving your nonverbal skills is an effective way of improving your parenting skills, according to Positive Parenting Skills. Instead of cooking dinner while your child tells you about her day, stop for a few minutes, squat to her height, look her in the eye and listen. Multitasking while your child shares important stories and events can be translated as a lack of interest. Many nonverbal gestures are as effective as words in communicating messages to children. Giving a crying baby a hug is one of the most effective nonverbal ways of telling her everything is going to be great. Holding her body next to yours is comforting and reassuring. Giving a school-age child a pat on the back or a high-five shows that you are proud. Even a handshake to a teenage son shows that you recognize his growth and maturity.